I should have known better than to complain about shops not having things in the right sizes because now my bank balance is seriously suffering. Still, excluding the serious shopping fail in January, it's been over a year since I've last shopped Manhattan and I have been on relatively good behaviour for the past few months, so I've probably earned it. I started off more virtuously today, though. I woke at seven, with no evidence of jet lag, and was on the subway downtown by seven-thirty. The sky looked overcast out of my window so I didn't think I needed to race for the sunrise but when I got outside, I could see some gorgeous oranges and pinks peeking through the skyscrapers along 51st Street. 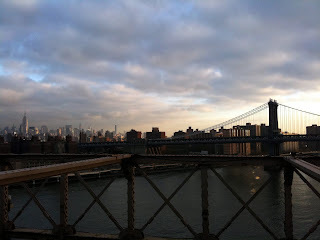 By the time I got to Brooklyn Bridge, the sun had mostly risen but it was still a gorgeous morning--bright and sunny but with enough of an autumn nip to keep me at a reasonable temperature while running. I squeezed my iPhone into the pocket of my leggings (in case I had any navigational catastrophes, even though my route basically consisted of: run over Brooklyn Bridge, run through the park at the end of the bridge until Hudson Street, turn right at Christopher Street, caffeinate intensively at Joe, smile), which meant I could take a few photos along the way. A macchiato and a bagel halfway back to my hotel helped the wake-up process. After a shower, it was shopping time. I decided to don my skinny jeans and head over to Williamsburg but I didn't do my research properly as the shop I really wanted to go to (Catbird) so I could buy one of their gorgeous, delicate gold necklaces, didn't open until twelve. I got there at just after ten and though I passed a happy half hour posing as a Brooklyn hipster at Verb, I decided as that the $4 round trip spent on subway fare was a sunk cost and as time was of the essence this weekend, I would head back to Manhattan. I was particularly anxious about visiting more J. Crews to see whether I could find the jacket and cardigan I liked in my size. My wish came true as I found both in suitable sizes, along with some dark-wash skinny jeans for short arses in the store near Union Square (subsequently, I found the jacket in an even smaller size and was able to exchange it). My bank account duly emptied, I spent the next hour or two wandering instead, which was a much cheaper occupation. The Union Square greenmarket should really have been called an orangemarket this weekend as there were huge quantities of pumpkins of all sizes, colours and even shapes, lining every stall. In fact most shops in New York seem to have at least one pumpkin in their window at the moment and everywhere you go, people are talking about their costumes for tomorrow. I met up with the rest of my party for lunch at Fanelli's, a favourite SoHo café. It was rammed and as we had to wait about 20 minutes in the crowded room, I was starting to regret having such a large J. Crew bag that seemed to get in everyone's way. Still, it was worth it when the food came. For once, I had neither a burger nor a club sandwich and decided to go for the festive option of pumpkin ravioli with alfredo sauce, which was delicious (even if I did have top pinch a few of Papa's yummy-looking fries). I spent most of the rest of the afternoon in NoHo and the Village. I managed to find a pretty, gold, star necklace at Edge Noho, an co-op of local artists and designers, flaunting their wares. My feet were killing by the time I made it back to the hotel but there is no rest for the wicked as I've got to go out again in a few minutes for steak at Del Frisco's, followed by a Broadway production of West Side Story. I'm not really a huge musical fan and I'm fairly sure my mother will be singing Tonight and I Want To Be in America for the rest of the weekend, but it should be fun. Isn't everything in this town?